You can do and see a lot in HRIS/Employee Self Service, select a topic to learn more. The State of Kansas Employee Self Service Center is not the same as K-State Self Service and does not use the K-State eID and password. After viewing Self Service data, please select "Sign Out" before closing your browser. You may review and update your address, phone number(s), emergency contacts, marital status and ethnic group (s) in Personal Information Summary. Please note: employees are encouraged to keep emergency contact information up to date to ensure that the department or Human Capital Services may promptly respond to a medical emergency. If changes are needed, select the corresponding yellow button. 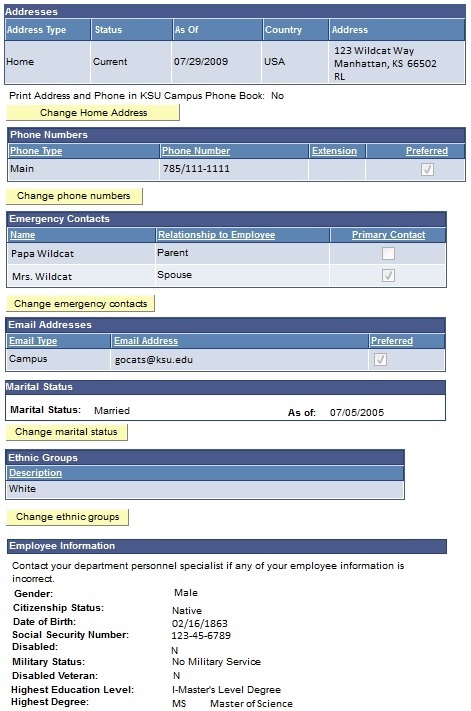 This page represents your primary job information that will be printed in the Campus Phone Book and that will display online in the K-State People Directory. Please submit discrepancies to your department personnel specialist. Paycheck information is available via HRIS/Employee Self Service the Monday prior to a payday. Select the desired check date link. Note: the Pop-Up Blocker needs to be turned off to view a paycheck PDF file. The most recent on-cycle paycheck will be the first check listed unless a paycheck has been adjusted. Adjusted paychecks will display the pay period end date in which the adjustment was processed. The Total Taxes includes Social Security, Medicare, Federal and State Withholdings. The Total Deductions includes all before and after tax deductions. If you have questions regarding your pay information, please contact your department personnel specialist. New employees may submit their W-4 and/or K-4 information via HRIS/Employee Self Service after receipt of the "Welcome to K-State" email. When claiming Single with 0 (zero) allowances, no action is required. Employees who have tax withheld for a state other than Kansas will not be able to update the State portion of Employee Self-Service. These employees will need to contact the Payroll office at (785) 532-6277 for additional instructions. Employees who maintain a visa will continue to submit paper W-4 form or K-4 forms. To ensure W-4 and/or K-4 tax changes will be reflected on the next pay check, update information on the pay day (Friday) prior to the next pay check. Ex: Make changes on Friday, October 24, for the pay check to be received on November 7. Update W-4 Tax Information: Displays your name, the last four digits of your social security number and the company in which your position is located. If you work for more than one company, there will be a line that states: For W-4 associated with a different company, select Company. Home Address: Displays your Home Address which is where your W-2 will be mailed. 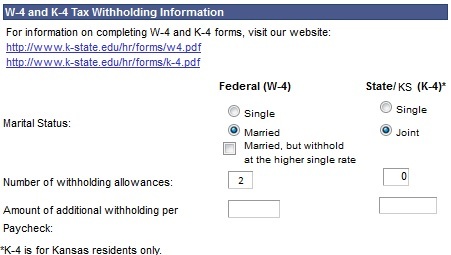 Select Marital Status for W-4: Single or Married or select Married but withhold at higher single rate. For K-4: select Single or Joint. Enter the number of allowances and/or additional withholding amount for W-4 and/or the K-4. Read the Claim Exemption section statements to determine if you meet the conditions to be exempt from federal and/or state tax withholding. If you determine you are eligible to claim exempt from federal and/or state tax withholding, select "Check Exempt here" boxes. Submit: Displays a statement to read and agree to before submitting your tax changes. Save Confirmation: A confirmation page will display and tell you that your change to your tax withholding may not affect the next paycheck you receive. You submitted W-4 data via the Web on (date you changed the information) and/or you have submitted K-4 data via the web on ( date you changed the information). For information regarding Employee Self-Service W-4 and/or K-4 Tax Information, please contact Anna Carroll at (785) 532-6277. 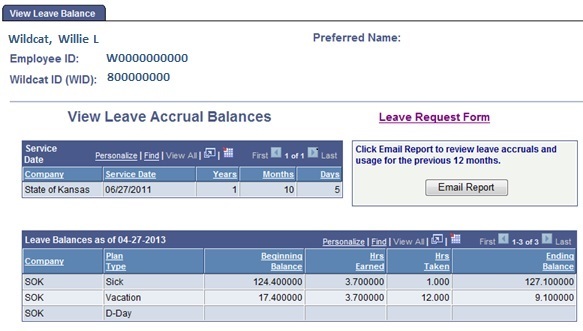 Allows you to view current leave accrual balances, service date, beginning leave balances, hours earned, hours taken and ending leave balances for the current pay period. Company: the Company in which you are employed (State of Kansas (SOK), Student Publications (PUB), Athletics (ATH) and the K-State Student Union (KUN)). Service Date: your length of service, including time worked in university support staff or unclassified positions, it does not include temporary non-benefits eligible appointments or student appointments. Dates are re-calculated when an employee has a break in service, including periods of leave without pay greater than 30 days. This date is a factor in leave accrual and longevity bonuses for university support staff. It is also a factor in leave payouts upon retirement and the calculation of layoff scores. Years/Months/Days: your State service broken down by Years, Months and Days. Plan Type: each plan type is listed separately: Sick, Vacation, Comp Time, Holiday Comp Time and Discretionary Day. For Discretionary Day, only the description will display (no hours) and it will only display if the discretionary day has not been used for the current year. Beginning Balance: your leave balance at the beginning of the pay period indicated. This is your balance prior to leave earned and used for that pay period. Hrs Earned: number of hours earned during the pay period. Leave earnings are based on service date and/or hours worked or upon FTE. Hrs Taken: number of hours taken/used during the pay period. This information will come from pay sheets/pay records. Note: The information displayed on the View Leave Accrual Balances page is for the pay period indicated and is updated on a bi-weekly basis. You may review your Medical/Prescription, Dental, Vision, Supplemental Life, TEA Life, Flex Spending, and retirement plan coverage or participation. This allows employees to view a summary of their direct and indirect compensation based upon information from the Human Resources Information System (HRIS). Direct compensation: Pay received for hours worked, holidays, leave, etc. Indirect compensation: Contributions by the University on behalf of the employee for insurance, retirement and employer required taxes. Includes salary, health insurance, life insurance, retirement, other benefits, and tax contributions for a given calendar year. The summary does not replace W-2 forms or other income tax related information and is not intended for use in tax preparation. Read the information on this page carefully before proceeding to the Total Compensation Summary page. Allows employees to view supplemental life insurance coverage amounts. Coverage amounts on this page do not reflect the 150% basic term life insurance every benefits eligible State employee receives at no cost. This page displays supplemental life insurance. Allows employees to enroll in KSU training opportunities coordinated by the Division of Human Resources, Training, Hale Library and other departments via HRIS/Employee Self Service. If applicable, please secure supervisor's permission before enrolling. The following session information will appear (i.e., session date, session number, location, start time, duration, open seats and waitlisted). Click the desired session number to view session details. Session details will appear. Click on "Continue" to begin the enrollment process. To submit the enrollment request, click on the "Submit" button. Comment: (Optional) Enter comments, if applicable. Note: Comments are optional, and will appear within e-mail registration confirmation sent to you, your supervisor, department personnel specialist and Learning & Development staff. If you have questions regarding your enrollment status, please contact Learning & Development at learning-develop-hr@ksu.edu. Please include your name, employee ID, course title, course code, and course session number. This allow employees to view a listing of the training they have completed through their department, Learning & Development, and the Division of Human Resources. A listing of the training sessions you have completed appears. If you have questions regarding this information, please contact your department personnel specialist.